Utrecht, the Netherlands, ca. 1440. Currently (2011) disbound. Previous mid-19th-century binding, tooled red morocco by Belz-Niédrée (Jean-Philippe Belz), preserved separately; rebound in maroon morocco by Charlotte M. Ullman in 1968 (M.917); 19th-century red velvet over boards (M.945). MS M.917: Purchased on the Belle da Costa Greene Fund and with the assistance of the Fellows, 1963. MS M.945: Purchased on the Belle da Costa Greene Fund and through the generosity of the Fellows, and with the special assistance of Mrs. Frederick B. Adams, Sr., Mrs. Robert Charles, Mr. Laurens M. Hamilton, The Heineman Foundation, Mrs. Donald F. Hyde, Mrs. Jacob M. Kaplan, Mrs. John Kean, Mr. Paul Mellon, Mr. and Mrs. Charles F. Morgan, Mr. Lessing J. Rosenwald, Mr. and Mrs. August Schilling, Mrs. Herbert N. Straus, Mrs. Landon K. Thorne, Mrs. Alan Valentine, Mr. and Mrs. Arnold Whitridge, and Miss Julia P. Wightman, 1970. Made for Catherine of Cleves, Duchess of Guelders. The manuscript was taken apart sometime before 1856. Its leaves were shuffled and then rebound into two volumes to make each look more or less complete. The first part (M.917, purchased from H.P. Kraus in 1963) was owned by Jacques Joseph Techener, of Paris, bookdealer; Prince Charles of Arenberg (d'Arenberg), who gave it to his wife Julie d'Arenberg, who then gave it to his nephew, Duke Engelbert d'Arenberg (until 1957), when it was bought by New York dealer H.P. Kraus, who sold it to Alistair Bradley Martin (Guennol Collection); Hans P. Kraus. This volume had been known by scholars as the "Hours of Catherine of Cleves." Meanwhile, the second part (M.945) had been acquired by the Rothschild family, who kept their manuscripts secret. In 1963 their volume was sold to the Morgan as yet another "Hours of Catherine of Cleves." Studying the newly acquired book (MS M.917) along with the Martin volume (later MS M.945), Morgan curator John Plummer determined that they were actually two halves of one and the same codex. In 1964 the Morgan mounted an exhibition of both volumes, displaying all the miniatures via color transparencies. When a facsimile of the manuscript was published by George Braziller in 1966, the exhibition was repeated. Finally, in 1970, the Morgan was able to buy the Martin volume (it became MS M.945), and thus came to own both parts of this greatest of all Dutch manuscripts. Both volumes have been disbound in preparation for rebinding the leaves in proper order. 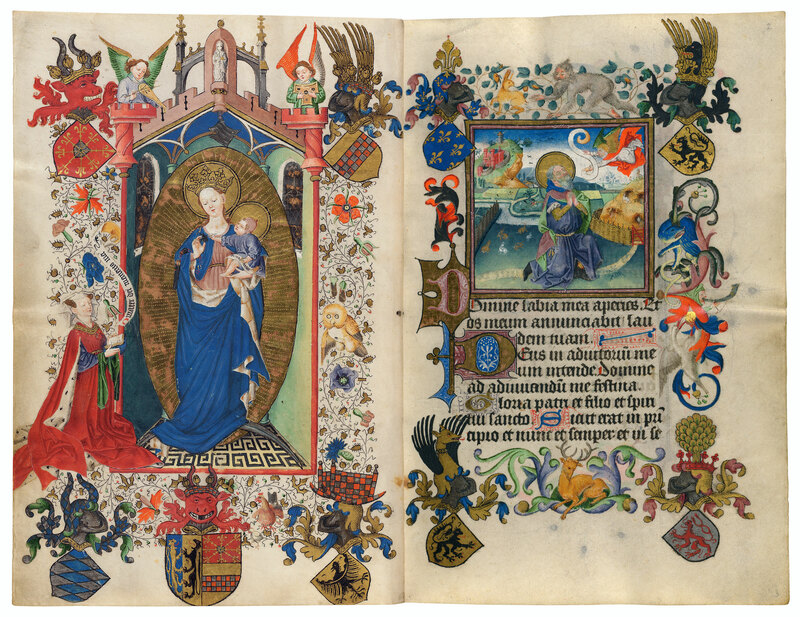 Ms. book of hours for the use of Windesheim; written and illuminated in Utrecht, the Netherlands, ca. 1440; manuscript separated into two or more parts sometime after its creation; brought together again under common ownership in 1970 (M.917 and M.945). Pierpont Morgan Library. MS M.917, which was paginated by a previous owner, contains 164 leaves; Pierpont Morgan Library. MS M.945 contains 194 leaves. Decoration: 10 full-page miniatures, 84 half-page miniatures, decorated initials, border decoration, pen flourishes (M.917); 15 full-page miniatures, 48 half-page miniatures, 1 historiated initial, decorated initials; almost all text pages have elaborate border decoration and pen flourishes (M.945). Artist: Master of Catherine of Cleves.